I found tutorial “How to Reset Counter Canon ip2770“, and hopefully it can answer all your question about software resetter for Canon iP2770. Resetting your printer software is not difficult but it is also not self-explanatory, so this tutorial provides the assistance you need. (PG-810XL, CL811XL Optional) and using Hi-Speed USB 2.0 interface to connected to computer. Canon Pixma iP 2770 support for Windows 2000 (SP4 only), Win XP, Vista and Windows 7 and also support for MAC OS: Macintosh OS X 10.4.11 – 10.6. 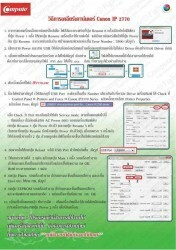 Note: All Download link and tutorial is taken from Thailand printer forum (http://www.compute.co.th). Use this info and tutorial as your own risk. Here the download link software resetter for Canon iP2770: Canon iP2770 Resetter. Related to "How to Reset Counter Canon ip2770"
as far as i know canon printer can only be reset permanently with software, and my friend from canon service centre told me that ip2770 that i can reset ip2770 only by online from canon. I’ve download the software you give above and i find ip2770.doc and i can not open that document with my microsoft office. Will it work on Canon Pixma iP2772 ? i have just use the software. i just follow the step by step procedure. it still doiesnt work…. Is it possible to change the extension file name from .doc to .exe? As far as I know, it is impossible to do that. That means that the procedure posted above is impossible to work..
boy-battz….it is possible….why dont you try it first b4 you complain…. Our dear boy-battz…>>>>> Changing file extension is so easy. If you know DOS, then it is easy. In windows, may be it is difficult to the slowers…Sorry. It works. Just follow the tutorial properly. DO NOT CHANGE THE REGION CODE. My printer is in ASA region but the resetter doesn’t work when I change the region code to ASA, so I used the default (JPN) region code. Once the ink catridge is out, then refilled, keep printing as normal until the printer refuses to print any further due to the “out of ink” status (triggered by the printer’s ink counter). The orange light will blink. Press that button (with the orange light) & hold for 5 seconds. The orange light will be off & the ink counter is reset. No need to mess around with the reset software. Enjoy ! Please, help me. I want resetter for canon pixma ip 2780 printer. Thank you!! its working!! try to follow the steps correctly..
Bad news for you all brother. 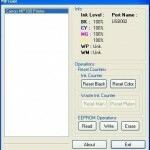 You cannot use that service tool to reset EEPROM or waste ink counter of that printer. Note this: SINCE 2009 EVERY PC OR LAPTOP THAT USED TO RUN SERVICE TOOL DISTRIBUTED BY CANON MUST BE REGISTERED TO CANON HEADQUARTER REGIONAL OFFICE. You can download the software anywhere but as long as your PC or laptop not registered to Canon regional office the software DOES NOT WORK!!!. Software that provided in above link for iP1000 series. LOL! @Rhinoseed haha,you are so right & i had trouble following the instructions on the resetter at first until i read your comment. thanks so much! 4.type ren ip2770.doc ip2770.exe then press enter. printer refuses to print any further due to the “out of ink” status problem can be solved. first turn off your printer. take out ur ink tank. switch on printer, put back ur ink tank. switch on…..it will works as normall. Thank you Rhinoseed!! it working……. i use restter of ip2770 but we have a probleme error code 0006 wat i can do??? plz put a resetter for ip2770 software..
i have tried all the resetters found on this site but none has work!! i think canon made something different on their program so that old resetters won’t work will some help me resseting my canon ip2770? i think all ip2770 produced some time november last year cannot be resetted using the old resetters!!!! my canon IP2700 can’t print yellow color at all. magenta & cyan is fine. then i try to check the ink (using tissue), those ink is displayed on tissue.. but when i try to print again, the yellow color not displayed.. could you help me? i have also tried all the version of the ip2770 resetters but no one works fine. anyone can help me please? I Tried already all resetter but it doesn’t work even ip2270.doc, change it to exe. still not working and still not responding, i think before you reset you have to buy brand new cartridge first before you reset. but the problem is the brand new cartridge is expensive. hope canon company will release the new working resetter for there customer to feel convenient. Please try this, it’s working, for the new canon ip2770 release…..
1. Turn off the printer without pulling the power cords. 4. Then Press Resume button 5 times then let BOTH buttons go. 5. You will notice that the Alternate Blinking error is gone, this means that the printer is in Service Mode state. weee! it worked! thank you so much! by holding the orange blinking button for 5seconds the ip2770 did the resetting on its own..! thanks Rhinoseed! Guys, whatever we do it will still not work. Maybe there are things not included in the procedures. Guys, help me find a resetter thats compatible with MAC! All i could download is .exe i need .dmg! Ahhhh! HELP! i tried service tool 3200 ekohasan.exe but still not working…and if i click some buttons in appears error 002 and 006…is there any procedure on how to use this tool? In going to the service mode, I followed the steps for almost 15 times already. I turned the unit off without, unplugging. I pressed and hold the resume button. Pressed the Power button and released the resume button. Pressed the release button 5 times and wait until the green light comes on, but only the only the orange LED lights up. I think because of that, the resetter tool cannot detect the printer. bakit po nagstop po ung blinking ng orange button nung sinunod ko po ung 5 times na pipindutin ung resume buttom…imbes na ang magsteady ng kulay ai ung green eh ung orange ung nagsteady….anybody help me?